Hey there! My name is Steve and I have been playing the guitar for over 15 years, I've been teaching for over 5 years, and I have my Bachelor of Music in Jazz Performance. 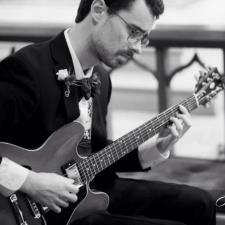 I enjoy playing Jazz, Bluegrass, Rock, Pop, Fusion, Funk, Jam and Singer/Songwriter tunes. Any of these genres I'm able to teach and give insight about playing and performing. I've worked with students who are absolute beginners to professional musicians who want to further their knowledge, all ages too! I've been gigging for over 6 years as well and I utilize my experiences to give my students the best music education in a holistic way. I am motivated, flexible and eager to teach! Take a listen to some of my music on soundcloud! The combination of going to school for music, having taught lessons for over 4 years, composing original material for over 5 years and actively gigging for over 7 years allows me to bring a unique and special mindset to the lesson space. I take the time to listen to my students to understand who they are and what they want to get out of the guitar. I create a lesson plan that is individual and unique because every student is individual and unique! I am also an avid composer and currently in multiple groups that involve my original music. I have a unique sound and style of composition that is rooted from music education and my personality. I can definitely provide insight and knowledge about composing, music theory and music in general, in addition to guitar. I currently work part-time at two music schools and am actively teaching through freelance. I am a very professional and qualified guitar teacher/music tutor who is eager to teach! Please feel free to contact me about any question or concerns you may have and I look forward to working with you! I have been an avid composer for over 2 years now. I currently am in two different groups where we are performing my original music. I also recently finished a project where I composed, performed and partially recorded all of the music for a podcast. I have my Bachelor of Music in Jazz Performance. I currently work part-time at two music schools and am an active freelance teacher. I have a great grasp of music knowledge and can provide insight into alot of different kinds and styles of music. I've worked with beginners who need help with pitch identification and note values to musicians who want to further their knowledge. Through my education and experience I am a well-rounded musician who is capable, competent and professional. I have been playing the guitar for over 13 years, I have been teaching guitar lessons for over 4 years and I have my Bachelor of Music in Jazz Performance. I currently work part-time at two music schools and am an active freelance teacher. On all of my teaching profiles I have received 5 star reviews and have great relationships with all my students. I take the time to listen to my students to understand who they are and what they want to get out of the guitar to give them personalized lessons. While working towards my Bachelor of Music in Jazz Performance, I have become very knowledgeable about music theory. I use it to compose, improvise, arrange, analyze and teach. In all of my guitar lessons that I teach, we touch upon music theory, depending upon their skill level and interest level. I am a dedicated, flexible and motivated tutor who would love to improve your music theory knowledge! I have my Bachelor of Music degree in Jazz Performance and throughout my college career I had to take sight-singing classes as part of the curriculum. I tutored fellow classmates that needed help with their sight-singing and pitch identification. I have a great ear for music, the ability to read and the patience to work with beginners. I've even helped vocalists prepare for auditions. I have been an avid composer/songwriter for over 4 years now. I currently am in two different groups where we are performing my original music. I also recently finished a project where I composed, performed and partially recorded all of the music for a podcast. I have learned alot from steve in only a few lessons. He gives great direction and is very knowledgeable. I have been playing guitar for around 10 years and would highly recommend steve to players of any skill level. If your looking to learn some theory or just to brush up on your chops then steve is your guy. Just started my lessons with Steve on guitar. I am so excited. It was easy and he is a great teacher!!! I literally had no idea what string is what and how to do anything. Thought it might be difficult not to do this in person, but it went amazing! Steve is a great, patient and understanding teacher. He is a tremendous guitar player who has the answers to all my questions. It's obvious that he's a trained and talented musician. I already knew how to read music and Steve has been showing me where the notes are on the fretboard, chord shapes and we've started talking about theory. He's also teaching me through online lessons and it feels like he's in the room with me. I'm excited to continue my lessons with Steve and am looking forward to the competent musician that I will become! Our 10 y.o. son is enthused to learn playing the guitar after his first lesson with Steve. He is looking forward to more lessons and learning more playing the guitar. Awesome first lesson with Steve, I learned more than I had previously learned from other instructors put together. He's really good at explaining things so they make sense. I'm looking forward to learning more with Steve. I was really struggling in my Music 101 class until I had a tutoring session with Steve. There are subjects where I do not understand things the first time and reading music happens to be one of them. However, Steve takes his time to explain it to you. He really breaks it down to the core if you need to take it to that level. I was afraid that I wouldn't find a tutor who would have the patience to explain things to me if I didn't get it the first time, but I was wrong. If you are interested in someone who is knowledgeable in music and has patience in explaining it to you, I highly recommend Steve.